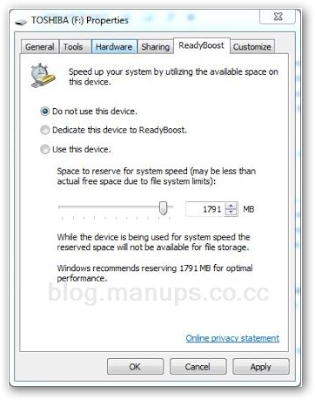 When a USB flash drive or thumbdrive is already been set up as ReadyBoost device, Windows 7 or Windows Vista system will automatically reserve and allocated Flash memory space for ReadyBoost system speed by creating a ReadyBoost Cache File named ReadyBoost.sfcache. User who wants to use the USB flash drive to save and store other data can disable or turn off ReadyBoost, and free up the disk space occupied by ReadyBoost.sfcache. 5. Click OK or Apply when done.